Summary: The main reason to watch Runaway Train is for the two towering performances by Voight and Roberts, some of the best work either has ever done. Runaway Train is an unusual hybrid indeed. A thunderous proto-Speed with exploitation trappings, it also works as an existential art movie with a serious director (Siberiade’s Andrei Konchalovsky – though to be fair, he also made Tango & Cash) and a dusted-off Akira Kurosawa script. It’s topped off by a title that makes it sound like it’s aimed at the under-tens. Konchalovsky’s movie starts as a typical but well-made prison drama. There’s the obligatory sadistic warden, played by a moustachioed, wonderfully sneering John P.Ryan. There’s bare-knuckle boxing and knife fights. There’s real life ex-crim and co-writer (not to mention future Reservoir Dog) Eddie Bunker as Jonah, the prison’s second-toughest nut. There’s Jon Voight as Manny, the prison’s toughest nut (so tough, in fact, he’s been welded inside his prison cell for three years). And there’s Eric Roberts as Buck, a dopey con who plays tougher than he is and desperately wants the respect of Manny. The max prison is located in the middle of the Alaskan wilderness. It’s winter. It’s impossible to escape. Only Manny and Buck do escape. They eventually come across a railway station and sneak on board a train they hope will take them straight to New York. But the driver has a heart attack. The convicts discover they’re now trapped on board – yes – a runaway train that’s virtually guaranteed to smash spectacularly into something. The only other person on board is a tomboyish engineer named Sara (De Mornay) who gets caught up in an escalating clash of egos. It’s pretty simple stuff really, but no less thrilling for that. The action is slowed down by talky scenes of train controllers arguing over how to stop the train, and there are no strong female characters (even Sara doesn’t do much beyond quietly simper). But that only feeds into the film’s central theme: the self-destructive nature of macho posturing. From the convicts’ journey into the abyss to the bitter rivalry between Ranken and Manny, and from the angry prisoners who hold Manny up as their hero to the railway managers who find their early cockiness ebbing away, there are few characters who come out with both their lives and dignity intact. 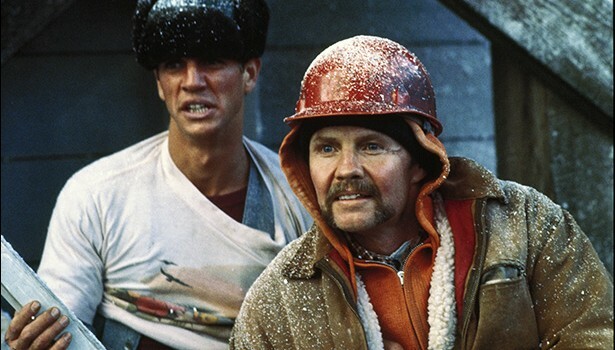 But the main reason to watch Runaway Train is for the two towering performances by Voight and Roberts, some of the best work either has ever done. Voight turns Manny into a noble, glint-eyed psycho, capable of inspiring an awed respect from those around him even though he doesn’t ask for it. Roberts is just as good as the puppy dog thug who’s desperately in need of leadership. The pair have a great, utterly convincing chemistry, and both invest their characters with a unique, almost hypnotic way of speaking. Despite their unpleasant nature you care about their doomed plight. They don’t make action films like this very often. A Trailers From Hell analysis from The Contender director Rod Lurie, and extensive and revealing interviews with Konchalovsky, Voight, Roberts and Kyle T. Heffner. For gossip hounds, the best bits come from a cheery Roberts and poker-faced Konchalovsky bitching about each other (albeit with added compliments). Konchalovsky recalls just how Roberts was difficult to work with (but admits his performance is terrific). Roberts sums up Konchalovsky as “the most pompous, arrogant, smart, driven man.. He’s Russian royalty and he lets you know it!” Jon Voight is nice about everyone.